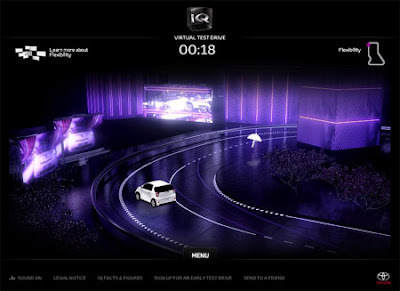 Toyota Europe has recently launched a virtual test drive for its IQ model. The website, created by the flash gurus at North Kingdom and Illianced allows users to drive the car through a futuristic landscape while discovering the main car features. The website is very nicely developed with a clean and simple design however, in my opinion, the experience isnt all that great as nothing could compare to the actual test drive. The concept is brilliant though. Hi - thanks for finding this; we hadn't spotted it yet. We've posted about the game on Toyota's official UK iQ blog. We'll be driving the car next week - check back on Monday for photos and more information.